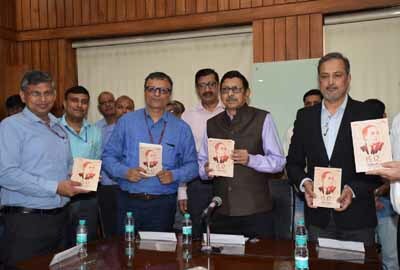 • Prasar Bharati releases booklet based on Dr.
Prasar Bharati releases booklet based on Dr.
NEW DELHI. On the occasion to mark 128th birth anniversary of Dr B R Ambedkar falling on Sunday, glowing tributes were paid to the great leader in a programme organised by Prasar Bharati in New Delhi. Prasar Bharati Chairman, Dr A Surya Prakash released a booklet on Selected Speeches of Babasaheb in the Constituent Assembly. Dr A Surya Prakash said, the depth of research done by Dr Ambedkar in drafting the Constitution in the pre-internet era was extraordinary. He said that Dr Ambedkar's contribution towards social justice and national unity is truly phenomenal and his speeches should be read and re-read to strengthen democracy.